The RusAir jet, which took off from Moscow at 22:30 local time (18:30 GMT) on Monday was due to arrive in Petrozavodsk at 00:04 on Tuesday (20:04 GMT Monday). 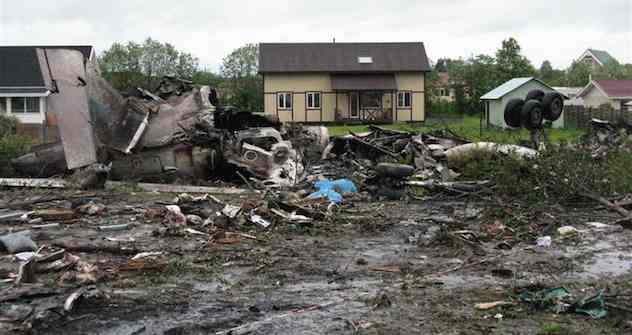 but crash landed on a highway one kilometer (0.6 miles) away from Petrozavodsk airport, which was shrouded in fog. The aircraft broke up and burst into flames on impact. Eight of the 52 people on board survived and were taken to local hospitals. A Health Ministry official said six were well enough to be transferred to hospitals in Moscow. "Health Ministry doctors have completed their examination of the victims. According to preliminary information, six people will be transported to Moscow for further treatment," said Sofia Malyavina, assistant to the health and social development minister. She added that two patients - a man and a 10-year-old child - were in serious condition, so the decision on moving them to Moscow had not yet been made. Sergei Goncharov, the head of the Health Ministry's National Center for Disaster Medicine, said earlier that a child had undergone vascular surgery at the Children's Hospital of the Republic of Karelia. The rest of the survivors have also received medical treatment, the official said. One crew member, female flight attendant Yulia Skvortsova, survived, a RusAir spokesperson said. Russia's Emergencies Ministry said that that among those killed in the crash were four foreigners - one Swedish and one Dutch citizen and two Ukrainians - and a family of four with dual Russian-U.S. citizenship. Police and air crash investigators are at the scene. Russian Investigative Committee spokesman Vladimir Markin said various possible causes for the accident are being studied, including human error. He added that a criminal case into the crash has been launched. Investigators have found out that the plane began to descend earlier than planned for unknown reasons, deviated from the runway and hit trees, and then power lines, a spokesman for Russian air transport regulator Rosaviatsia said. The airport’s infrastructure, including the lighting system, had been operating normally until the moment when the aircraft hit the electric power lines, he said. The aircraft's flight data recorders have been recovered. Investigators in Karelia have taken custody of the voice recordings between the air traffic controllers and the aircraft’s crew, according to regional investigators. “The voice recordings of the air traffic control service at Petrozavodsk airport with the aircraft’s flight crew have been obtained, and information requested about weather conditions. Investigators have also taken documentation from Domodedovo airport [from where the aircraft took off] and fuel samples,” investigators said. The Tu-134 is sixth highest on the list of aircraft crashes by type according to AirDisaster.com, but that figure can be misleading, as it ignores the fact that an aircraft’s safety record is often as much down to the operator as the actual reliability of the aircraft. Many Tu-134s were operated by independent carriers which split off from the Soviet monopoly Aeroflot when the USSR broke up in 1991, many of which had a poor operating safety record. “The poor safety record for Russian aircraft on domestic flights is more likely the result of the lack of ‘well-oiled’ system of state regulatory bodies specifically dealing with flight safety. Rosaviatsia [the Federal Air Transportation Agency] is too busy performing a multitude of other tasks to pay close attention to flight safety and this burden lies mostly on airlines themselves,” he said.